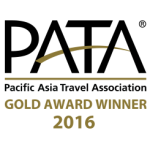 Soft launched in mid-2015, the completely re-designed MekongTourism.org digital platform has already received prestigious recognition for its strategic approach and innovative design by winning a 2015 HSMAI Adrian Award, a 2016 PATA Gold Award, and a 2016 Travelmole-ITB Asia Award. 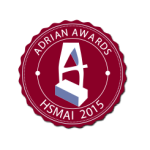 T he 2015 Hospitality Sales & Marketing Association International (HSMAI) Adrian Awards were extremely competitive with more than 1,300 entries submitted. 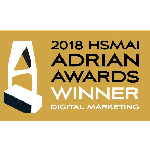 The Adrians recognize the best in advertising, public relations, and digital marketing in the hospitality and travel industries. 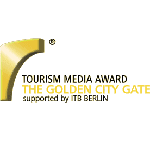 MekongTourism.org was judged to be exceptional by experts in the hospitality, travel, tourism and media industries due to its integrated approach. 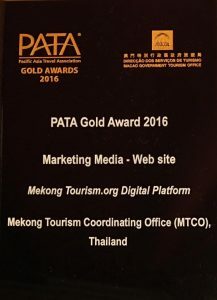 MekongTourism.org also won a 2016 PATA Gold Award in the Website category after been endorsed by a judging panel of travel and tourism professionals who believe the website contributes positively to responsible tourism in the Greater Mekong Subregion (GMS). 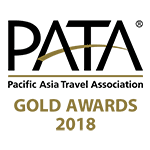 The PATA Gold Awards are presented annually by the Pacific Asia Travel Association (PATA), which represents both public- and private-sector travel & tourism stakeholders in the Asia Pacific region. 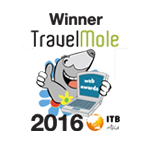 The TravelMole – ITB Asia Awards recognise the best web, social, mobile and travel technology deployments in the Asia Pacific travel & tourism industry. The award ceremony took place October 20 at ITB Asia in Singapore. 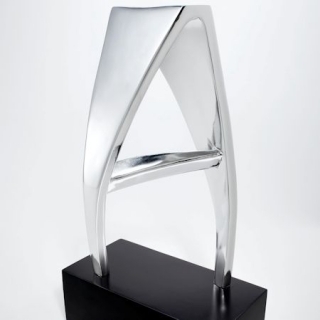 MekongTourism.org won the Responsible Tourism Website category. 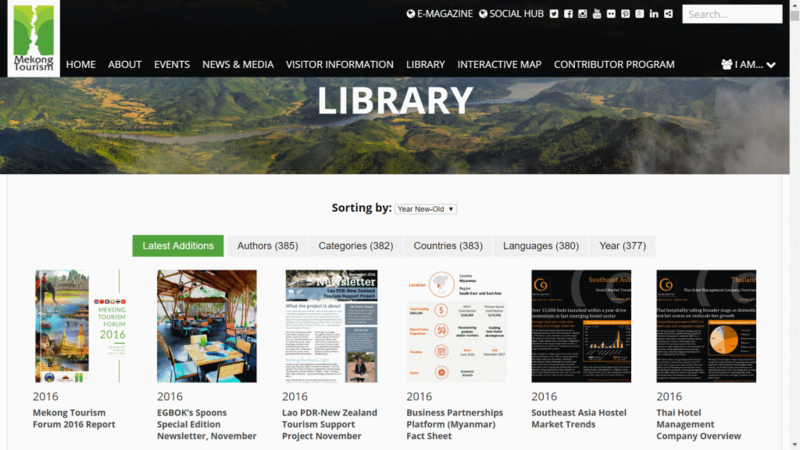 The e-library curates reports, presentations, training manuals, and other documents, relevant to travel and tourism in the Greater Mekong Subregion (GMS). All documents in the library are available for free download, and are searchable by country, language, topic, author, and year.Please contact us if you have any documents that you would like us to consider adding to the library, and find out more about Industry Collaboration, and our Verified Mekong Tourism Contributor Program. We also archive multi-country tour and cruise itineraries in PDF format and development project reports and documentation. Multi-Country Journeys are a collection of tours or cruises that involve traveling in more than country in the Mekong Region. Travel can be by any means, from river, rail, or road. Tour operators are encouraged to send us their journeys in storytelling format of around 500 words with 2-3 photos, quotes from travellers, highlighting the uniqueness of the experience. The article will link to the actual tour itinerary on the tour operator website. Tour/cruise operators should send us their multi-country itineraries in PDF format for hosting on the e-Library.Writers, bloggers, and travellers are encouraged to send us their multi-country journeys. Experiences in only one Mekong country can also be considered if its has a strong sustainable or responsible tourism angle that can be a case study for the region.Please contact us if you have any multi-country journeys or articles, and find out more about Industry Collaboration, and our Verified Mekong Tourism Contributor Program. The Events Calendar features events in the Greater Mekong Subregion in four categories: Public Holidays, Travel Trade Events, Mekong Tourism Events, and Consumer Events. Any events, from farmers markets, cultural festivals, food fairs, tourism conferences, to trade shows can be considered. Any organization hosting an event is invited to submit it to us, including the event name, 1-2 photos, a short and long description, a website link, location and dates, and contact information. Please contact us if you have any events, and find out more about Industry Collaboration, and our Verified Mekong Tourism Contributor Program. Our weekly e-newsletter links to the most important articles and news about travel and tourism in the Mekong region from the past several days. View past e-newsletters and sign-up to stay in touch with us. Subject matter experts, such as consultants, company executives, journalists, and bloggers active in the GMS can apply to become a Mekong Tourism Expert or Mekong Travel Storyteller. In return for providing regular (non-exclusive) content at least once a month, the contributor is featured on the website with a short bio and photo as well as link to the blog or website, and a range of other profile-enhancing benefits. Each article will be attributed and credited, and if requested and supplied, will link to the expert’s website or blog. Each published article after having gone through the required editorial process will be promoted on social media, featured on the homepage for certain period of time, and in select cases even featured on the monthly Mekong Tourism e-newsletter.Articles can be about interesting multi-country travel experiences in the GMS, single-destination experiences with strong sustainable or responsible tourism angles, as well as travel trade articles. Contributors are welcome to apply by focusing on their subject matter expertise or interest, such as (but not limited) to culinary tourism, river tourism, heritage tourism, community-based tourism, adventure-tourism, religious tourism, luxury tourism, budget tourism, aviation, hotel development, tourism investment, as well as deep expertise in any of the six member countries. Through the contributor program, MTCO is building a powerful community of subject matter experts who will benefit from by being recognised as “Official Mekong Tourism Content Contributors”. We have created ten online magazines optimized for mobile devices and powered by Flipboard. The online magazines categorize the articles on the website by interest, from Active Mekong (Sports), Adventure Mekong, Celebrate Mekong (Festivals and Events), Chill Mekong (Spa and Wellness), Cruise Mekong Experience Mekong (Travel Experiences), Heritage Mekong (Culture), Responsible Mekong (Community and Sustainability), Spiritual Mekong (Religious Travel), Taste Mekong (Gastronomy), and Tourism Mekong (Travel Trade News), as well as new additions to the e-library. This makes it very easy to consume content on the go, and customize the reading experience by interest. 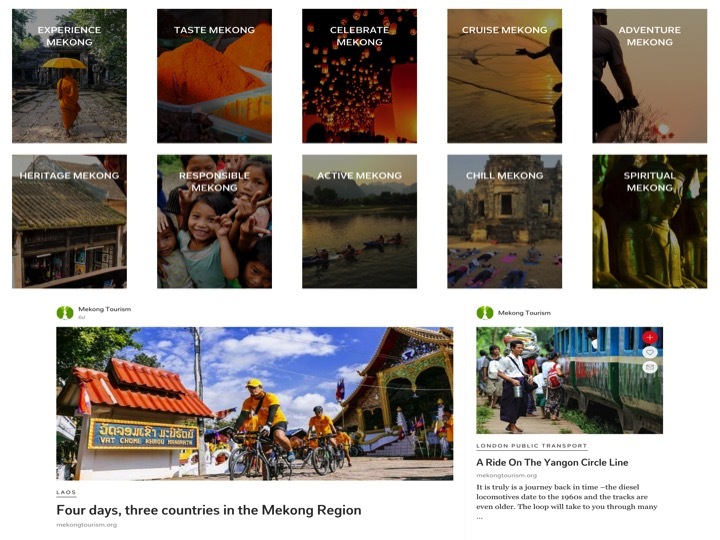 Since the online magazines are powered by Flipboard, it is very easy to download the Apple and Android apps and follow @TourismMekong to get notified when new articles are available. Other than that, it is also simple to just visit https://flipboard.com/@TourismMekong. The Interactive Mekong Tourism Map uses Google Maps as a platform and service to show the location of thematic routes, points of interest, and attractions in the Mekong region. The Mekong Tourism Coordinating Office (MTCO) and GMS Tourism Working Group take no responsibility for any data and information provided, nor the accuracy of content provided on the Interactive Mekong Tourism Map, powered by Google Maps. The Mekong Tourism Forum is the annual tourism conference for the GMS, which provides a cooperative platform for public and private sector stakeholders in the tourism industry to discuss the development, marketing and promotion of travel to, from and within the Greater Mekong Subregion (GMS), and monitor sustainable and responsible tourism growth. We have developed a dedicated Mekong Tourism Forum event website, which can be viewed at MekongTourismForum.org. We have created compelling content about Cambodia, Laos, Myanmar, Thailand, Viet Nam, and Yunnan Province and Guangxi Zhuang Autonomous Region, China — six countries connected by the majestic Mekong river – the unique Greater Mekong Sub-region (GMS) in Southeast Asia. Each page links directly to the official website of the respective National Tourism Organization. In addition, we have put together a reference page when it comes to Visas and Border Crossings. In order to inspire the GMS’ travel and tourism industry and travellers alike, we have created a unique Social Media Hub, aggregating tagged social media content on one page on the website. In addition, we are active on the key social media platforms, using our universal handle of @TourismMekong. Join the conversation on: Twitter, Facebook, Instagram, LinkedIn, Flipboard, Google +. In order to be customer-friendly to our key stakeholders that engage with the MekongTourism.org, we have developed customized landing pages that makes it easy for Travelers, Media, and Businesses (and travel and tourism professionals) to quickly find information on the website, without having to spend lots of time searching for it. The landing pages are easily accessible from a drop-down menu on the main navigation bar.